Before I was married, I used to struggle with being content. I was longing for the opportunity to meet a handsome man, get married and start a family. It wasn't an obsession or a depression, but it did stir in my heart discontentment with my current single situation. But coming back into the present, I realize that I am now again struggling with feelings of discontentment. No, it's not with my husband or personal life, but with my professional one. When I started with this company after college, I was thrust into training and certification classes and tests. And upon completion of them, my salary increased. I was excited, and the world seemed full of endless possibilities. Any career path I looked toward seemed both pleasurable and attainable. 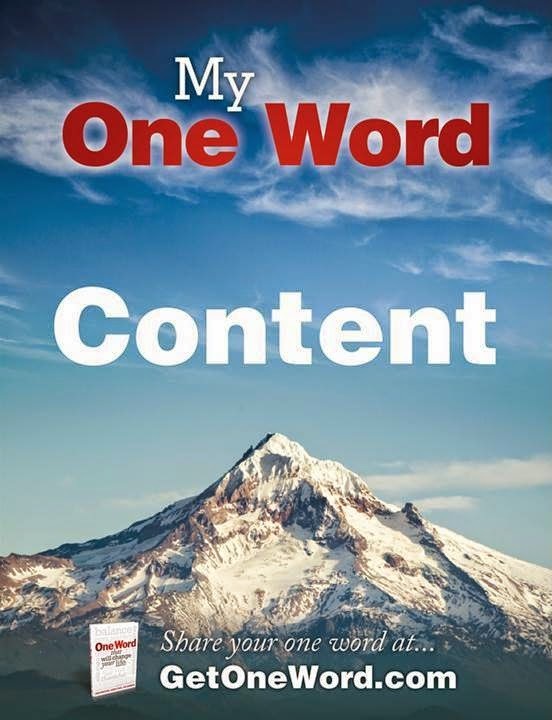 It is for that reason that my word that I want to focus on for this year is content. Last year was the first time I had the experience of choosing one word to focus on and I chose grace. (You can read more about how I discovered One Word and why I chose grace here.) I am happy to report that through studying scriptures about grace and discovering more fully God's grace, I have been able to respond with more grace myself and really see a difference in my understanding and graciousness now from what it was a year ago. And so I hope that for 2015, as I study about being content that I will again become content in all aspects of my life and firmly and fully remove all traces of discontent that I have. If you would like to join me in choosing One Word to focus every aspect of your life on, spiritually, mentally, physically, you can visit this website for more information and to make your own poster. And, I hope you share what your one word is, because I would love to join you in praying over that word as I hope you will begin to pray for me.